Here is the story of a school and a college which rose from the dust. In 1938, a school was running in a little shanty room with a total strength of 11 boys, one teacher and bank balance of Rs.11. The salary of the teacher was only Rs.12 per month; but the school was on the verge of closing down. Then the miracle happens! A postman takes over its management and by 1944, the school has a fund of a few hundred rupees. The school is well-established with students four-fold and more class rooms. In 1946, the postman's 'Deewali baksheesh' of Rs.4500 and funds collected by staging a play brings the total to Rs.12,000. And the postman and his wards go from strength to strength. Let us view this drama as it unfolded. Way back in 1938, the Hindi School at Ghatkopar was one of the only two of their kind in Bombay [now Mumbai]. It was in doldrums when a young postman Nandkishor Singh Thakur, pledged to give his spare time to the school. Well, if Hindi School was an unimportant, unknown school in a suburb of Bombay, Nandkishor himself was an uninfluential person. Born in 1897 in a village in UP, his own education was two years of study in the primary school. But he had seen the world in the first World War - in the Middle East as a Corporal in the Infantry. Five years of stay in Turkey as a part of the British Army had made Nandkishor a changed man. In 1926, he joined the Post and Telegraphs department as a Postman in Ghatkopar. But his dreams were bigger. He wanted to have a more purposeful existence. And he found an outlet. The combination of this humble, unassuming, simple postman and his little-known one room institution in one of the suburbs of Bombay has now become an epic story to remember. What is it that drew this short, bald man with a walrus moustache to this school? What was it that made him put [--does so even today] all that he had and 'a little more' to make things better than before? Perhaps, he himself has no answer. Hindi School was in a very bad shape when Nandkishor took it over. He didn't know how he was going to add to the bank balance of Rs.11 that was all in the name of the school. But he knew that he had access to all and sundry in that locality as a postman. He made use of his contacts. He carried along with his postbag a small box in which people could drop anything upward from a paisa [1/64th of a rupee]. It was a paltry sum to begin with but the school survived. More than that, people came to know of the school and its humble organiser. The school received its first large sum in 1946. Nandkishor declared that whatever 'Deewali baksheesh' he would get from the people would be added to the school fund. People gave generously. He collected about Rs.4,500 that way. In a play staged in the same year, another sum of Rs.7,500 was collected, bringing the total to Rs.12,000. The school had come a long way from the days of Rs.11-reserve-fund. We owe it to 83 year old Dr. N H Athreya for this treasure of a story. 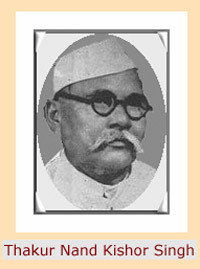 In the 1960s Dr Athreya ran a slim magazine called 'Excellence' and the story of Thakur Nandkishor Singh appeared there. Dr Athreya is a wonderful story by himself and you can read more about him here. GoodNewsIndia was determined to re-publish the story but not without a photo of the hero. It has been a year long effort to get one. Many promises were broken and in these busy times not many people seem to have time for this sort of whim. Also, GoodNewsIndia being a one-man-op doesn't have the resources or the speed. We finally have it because of a high school student of Thane, called Vinay Subramaniam. Gaze awhile at Nandkishor Singh. Some understanding may emerge of the magic of this land that produces people like him. It is GoodNewsIndia's experience and belief that most of the Good-India is owing to rough salts of the soil like Nandkishor. They know their land better than many privileged, 'educated', pedantic Indians. They are quicker to gratitude, slower to complaints, unimpressed by odds and steadfast in their labours. Note also, their touching veneration for formal learning that they themselves did not receive. It is India's luck that their numbers are a legion, though you would not believe that given the fare you receive from mainstream media. After reading the story, may we identify in real-time, the several Nandkishors that are now trudging our streets with collection boxes. The story as it appeared in 'Excellence' was credited to Daktar Postal News, probably a house journal of the P&T Dept. The article appears with little editing. The real author of this article is unknown. But thanks to the anonymous author, we have an opportunity to salute a hero. We also have some achingly nostalgic views of a leisurely Mumbai: a school and a college built under Rs.500,000? Some times! Is there any reader out there who can enlarge on this story? Did Nandkishor live to a 100? What else did he do at Rampur Manjha, UP? Do folks remember him? What became of his son and grandson? Is there an alumnus from the college who remembers the man? Are there Ghatkopar residents who remember him? Who bought phenyle, or insurance from him? Or made a donation to the college? Are there more photographs out there? GoodNewsIndia would be delighted with feedbacks.